Based on the above table, which quantities have true units and dimensions. 2. 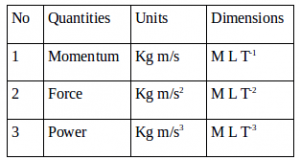 Based on table below, quantities with correct units and dimension are…. The equation of momentum is p = m v.
Unit of mass (m) is kilogram (kg) and unit of velocity (v) is meter per second (m/s) so that unit of momentum is kg m/s or kg m/s. Kilogram is the dimension of mass with dimension of [M], meter is a unit of length with a dimension of [L], second is the unit of time with dimension of [T] so that dimension of momentum is [M][L]/[T] or [M][L][T]-1. The equation of force is F = m a. The equation of power is P = W/t, the equation of work is W = F s, the equation of force is F = m a. Unit of mass is kilogram (kg), unit of acceleration is meters per second squared (m/s2) so that unit of force is kg m/s2. Unit of displacement is meter (m), unit of force is kg m/s2 so that unit of work is kg m/s2 x m = kg m2/s2. Unit of time is second (s), a unit of work is kg m2/s2 so that unit of power is kg m2/s2 : s = kg m2/s3 or kg m2 s-3. Unit of mass is kilogram with dimension of [M], unit of length is meter with dimension of [L], unit of time is second with the dimension of [T] so that dimension of power is [M][L]2/[T]3 or [M][L]2[T]-3. 3. Power is defined as the rate at which work is done. Or power is the ratio of work to the time interval. Determine the dimension of power. m = mass (dimension of mass = M), d = distance (dimension of distance = L), t = time (dimension of time = T).